Marriage is a bond built between people strangers to each other. Okay, not the case in love marriages. However, Indian marriages are based on this very belief that matches are made in heaven by the Gods. People here make everything related to marriage an important affair and one such element is the wedding destination. The venue of wedding is a significant element for couple and their families. As the modern trend sets in, so do modern wedding ideas and this has augmented the idea of wedding destination all over the country. After the royal palaces of Rajasthan, one popular venue is a wedding destination in the Himalayas – Triyuginarayan Temple. Here’s everything why the temple is one of the best wedding destinations in India today. The temple is situated 12 kilometers from Kedarnath, the popular Hindu Temple. 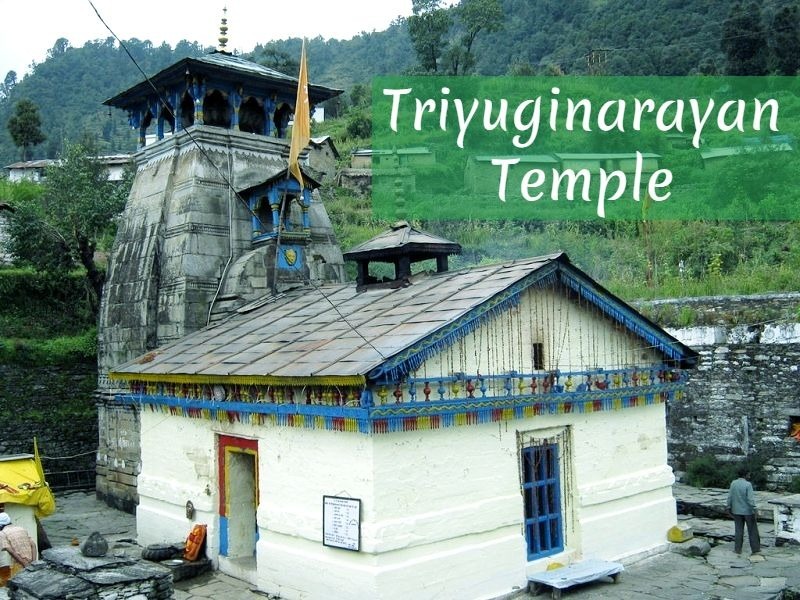 The Triyuginarayan Temple serves as a solid landmark of the village (Triyuginarayan) in Rudraprayag District, Uttarakhand. The architecture of the temple is identical to that of Kedarnath and is believed to be constructed by Adi Shankaracharya. The most exceptional thing about the famous temple is the fire burning in the temple’s courtyard since last three Yugas (eras) according to the Hindu mythology and as such named as Akhand Dhuni Temple. The Temple is the wedding place of Lord Shiva and Goddess Parvati for which it is recognized to be one of the blessed wedding destinations in Himalayas and perfect for a hill station wedding in India. The flame burning since ages is the flame lit on the wedding of the almighty and Goddess and since then it has never extinguished. According to the facts and incidents discussed in Hindu mythology, Goddess Parvati served atonement to please the almighty Shiva at Gaurikund, located close to the village of Triyuginarayan. Following which Lord Shiva gave proposed marriage to Goddess Parvati at Guptkashi. Back during the era, Triyuginarayan was the capital of Goddess Parvati’s father, Himavat where the marriage took place. The sacred wedding was formalized by the greatest Lord Vishnu and attended by all the Hindus who later took dip in the ponds in the village (3 of the 4). Your wedding is something both of you will remember for life. So, cancel that business class flight booked months ago for the conference abroad and reach Triyuginarayan for a wedding most blessed and memorable. Why couples choose Triyuginarayan as a Wedding Destination in the Himalayas? The state government of Arunachal Pradesh has taken a planned initiative of promoting Triyuginaryan as an ideal destination wedding spot in India with an intention to popularize the state’s roots of rich tradition and culture. The government is making efforts to offer the best wedding planning services in Uttarakhand while providing Triyuginarayan as a sacred venue to tie knots of marriage. Want to get married in a super religious style on the lap of the Himalayas? Here’s why you should wait no more and book your last minute flights to have a simple yet grand wedding. The individuals can have a wedding in a place of high religious values, food and music, giving a local touch. The location is surreal and quite offbeat offering a perfect background for a religious wedding. Along with the religious feel, blessings of the Lords and the scenic setting in the Himalayas, you get to have a wedding within budget as the cost of the venue is just 20-30% of the figures you pay for a hotel or marriage hall. The state government is considering weddings performed for both domestic and international couples in their respective traditions. Circumambulating (taking phere) around the holy fire makes the ritual holier than ever for both the couples and attendees. One can reach the holy Triyuginarayan village easily by covering the 260 kilometers distance from Dehradun Airport by road. From Rudraprayag, one can get taxis easily to cover the distance of 81 kilometers to Triyuginarayan Temple. If you are planning to have a destination wedding in India and wish to tie the know in a peaceful and celebrated place, the wedding destination in the Himalayas, Triyuginarayan Temple is an ideal place for you.